100WF NextGen: What's it all about? This time last year I was hustling hard to try and get a last minute ticket to the very first NextGen Inspire event. Luckily I did because so much changed off the back of that event that I may be in a very different place had I not made it! Last year 100 Women in Hedge Funds, a global, philanthropic organisation focused on all things women in business, rebranded to "100 Women in Finance" as a truer reflection of their broad membership. Alongside this expansion, "100 Women" as it's affectionately known, launched a fresh, new sub-division called "NextGen" and it was perfect timing for my career journey. "The launch of the Next Gen group in Cayman is part of our global commitment to ensuring that we provide this vital support to young women starting out in their careers, so they can better face the challenges and opportunities in the finance industry" ~ Christina Bodden, 100WF Founding Member. To formally kick off the NextGen initiative, the Inspire event was created: a half day innovation forum designed for professional women in the Cayman Islands, with content and interaction points specifically tailored to 100WF Next Gen members. At this point in my career my confidence had taken a bit hit (understatement of the year), my work-life balance was not to be desired and I certainly wasn't feeling inspired by life as a lawyer. Spending the afternoon away from my desk felt really stressful and I remember saying I would skip the last talk and head back to the office. Thankfully I didn't as it was one of the best! The Inspire event consisted of a full afternoon of talks, breakaway sessions and networking. Being the first of its kind, we didn't know what to expect but simply put, it was fantastic. Every one of the inspiring panelists had such an interesting and engaging perspective to share on topics such as millennials in the workplace, career progression and work-life balance. It's like they were talking to ME. Well, I guess that was the point being the exact target demographic! One of the fantastic NextGen Inspire panels. Photo by Melissa Wolfe. The three talks were split up by strategic breakaway sessions. In the past I've found that organised group sessions can be painful and a little lacklustre at events like these, often with me turning into "chatty Kathy" and asking too many questions. But at Inspire, the well-planed sub-groups included a diverse group of people led by one of the encouraging panelists. This proved to be a really valuable interaction for me. Listening to panelist Jackie Doak (President of Dart) who instead of speaking of behalf of Dart's millennials, actually formed a group and asked them their thoughts before coming to present them. That really was impressive leadership. For me personally, Inspire acted as a chance to open up about my side-hustle Lustic Life, and engage with others who had past or current struggles with fulfilment at work. 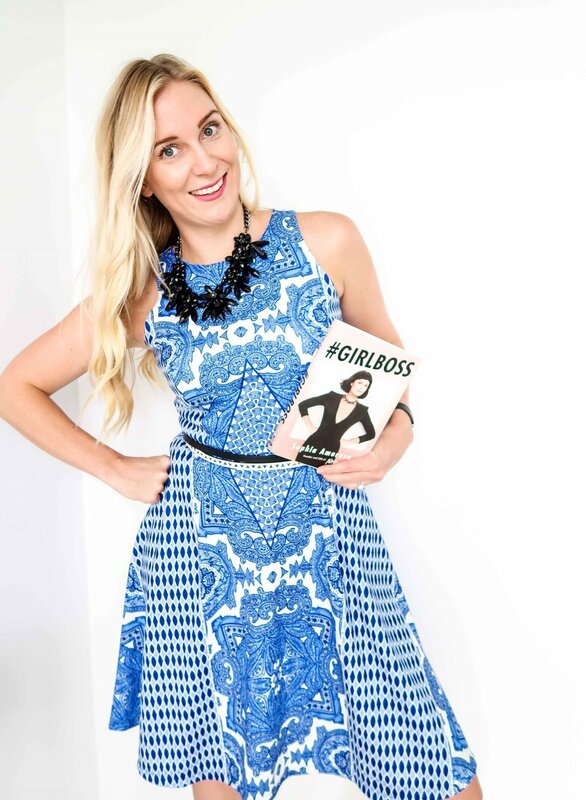 For the six months' previous to Inspire, I had been consumed with some fantastic self-help books like: "I AM THAT GIRL" by Alexis Jones, "You Are A Badass" by Jen Sincero and of course the now Netflix-immortalised "#GIRLBOSS" by Sophie Amoruso. (If you've not read any of these, ditch this drawn-out blogpost and go read them IMMEDIATELY. If you want even more, here's a previous blogpost on Inspiring Reads to keep you happy and motivated). I hadn't however, experienced much conversation about my personal and professional growth and the event timing was perfect. At the end of Inspire, I distinctly remember having a poignant conversation with the fabulous Danielle Young (Shirlaws business coach and 100WF NextGen Committee Member), who I hardly knew at the time. Danielle took the time to introduce herself to say she knew my husband and followed my blog; which in itself was a magical moment and the start of me really noticing its momentum. But even more importantly, Danielle gave me some really sage advice and it stuck with me: at some stage I would get to the tipping point where my new venture felt more of a career priority than my day job and the momentum of progress would allow me to take the big leap. (Or similar. She said it much better and with very helpful hand gestures!). And that really was the truth. I had been quietly blogging for a couple years, purely as a creative outlet, elusively named "Lustic Life" so I could go under the radar whilst working as a corporate lawyer. However by putting my material out there, I hadn't appreciated that my modest following was growing and soon enough I was approached to assist a couple of companies with their social media content and branding. Before I knew it, a new venture had organically formed out of what I was doing for free! In changing my career and starting something new, I found it true that there isn't really one defining moment that transforms your life in an instance, but instead a collection of small but powerful mini moments that have a lasting impact over time. A panel on The Science of Confidence: What is presence? See you then, if not before!